If you've been tuning in for my sporadic summertime posts, you'll know two things for sure. First is that I am OBSESSED with all things garden related. Second is that I have a rockin' tank top tan to show for it. The third lesser known fact is that I don't need to be the one growing fresh veggies to be obsessed with them. I am also a big fan of my Community Supported Agriculture (CSA) vegetable box. Farmer's market veggies fresh each week without having to wake up early on Market day. Hooray for sleeping in! You'll get to taste test new and exciting types of veggies without asking weird questions in the grocery store. Hooray for being socially awkward! 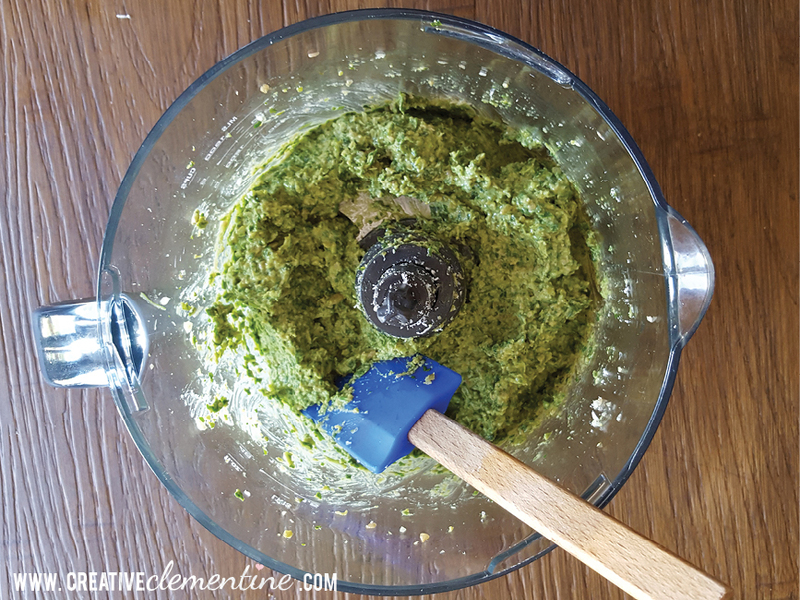 This garlic scape pesto recipe. 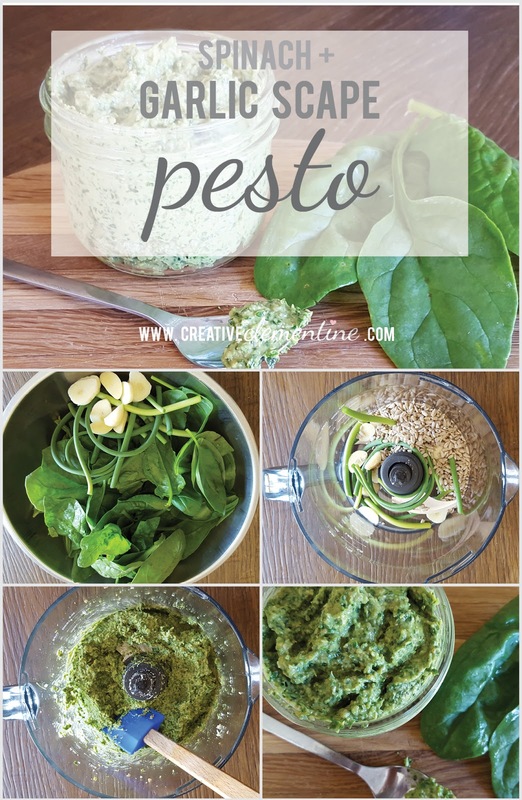 I am a huge fan of pesto at the worst of times, so it's no surprise that this recipe has made its way onto my summertime hit list. 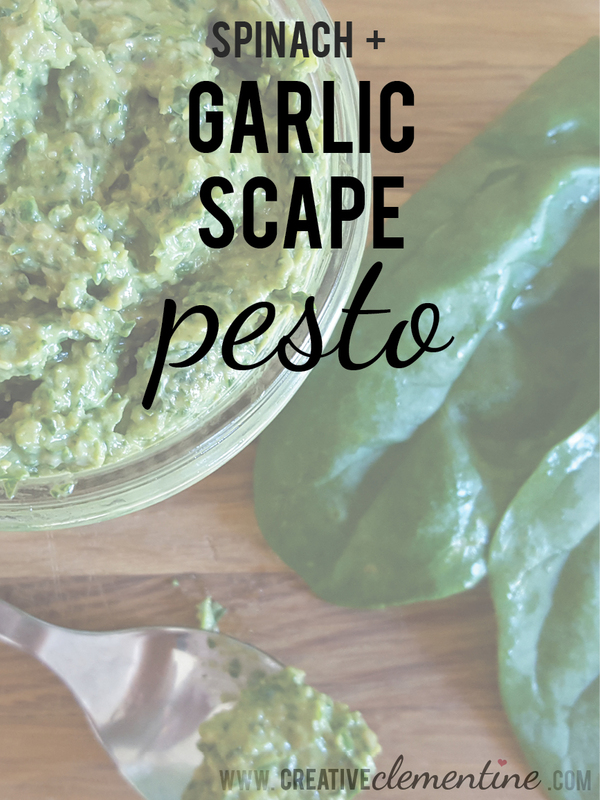 There is something so luscious about the flavour packed into garlic scapes, and this pesto really lets it shine. The best part? It's incredibly easy. And versatile. And nut-free. It's great on chicken, pasta, and even mixed with mayo on sandwiches or paninis. And don't even get me started on the veggie marinade possibilities here. This stuff is green gold. First things first: wash and roughly chop all the veggies. Don't go too far, though. The whole point is that it's lazy. 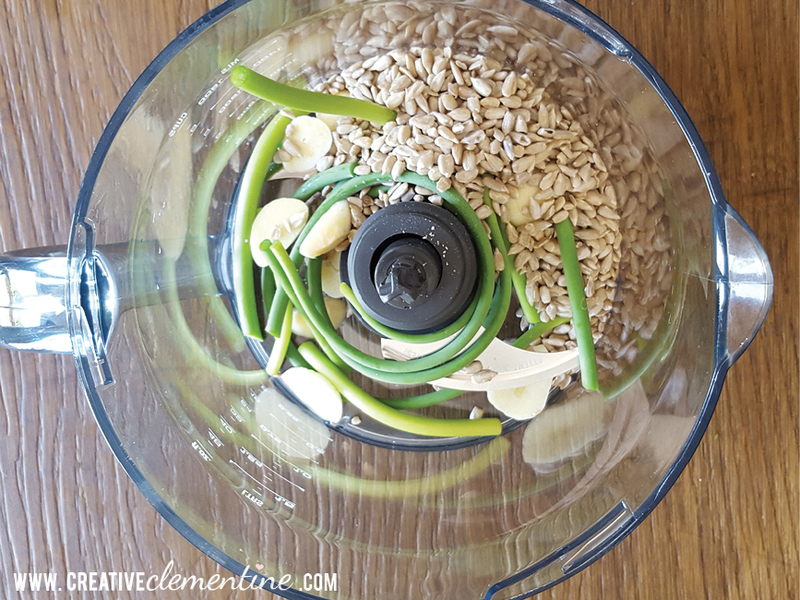 Add the sunflower seeds, garlic scapes, garlic and to a blender or food processor. Give it a whir for a minute or so, then slowly add the rest of the ingredients. Keep adding olive oil until it's the consistency you like. If you want to add a squirt or two of lemon juice, you can. 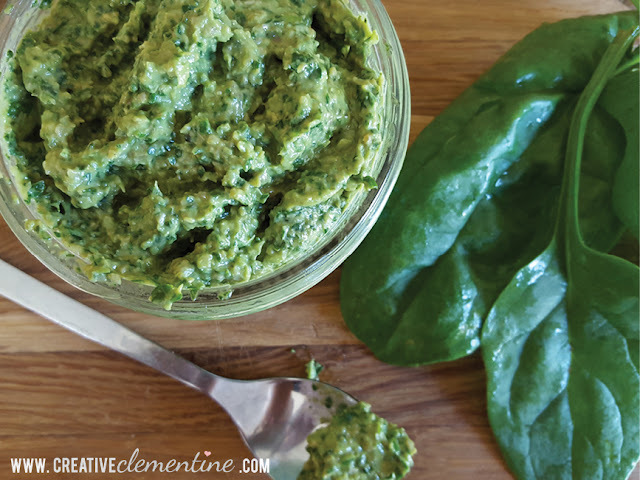 It will add a bit of acidic flavour, but also maintain the colour for a bit longer. Once it's done, put it on everything. Okay, probably not the baby. But everything else is fair game! 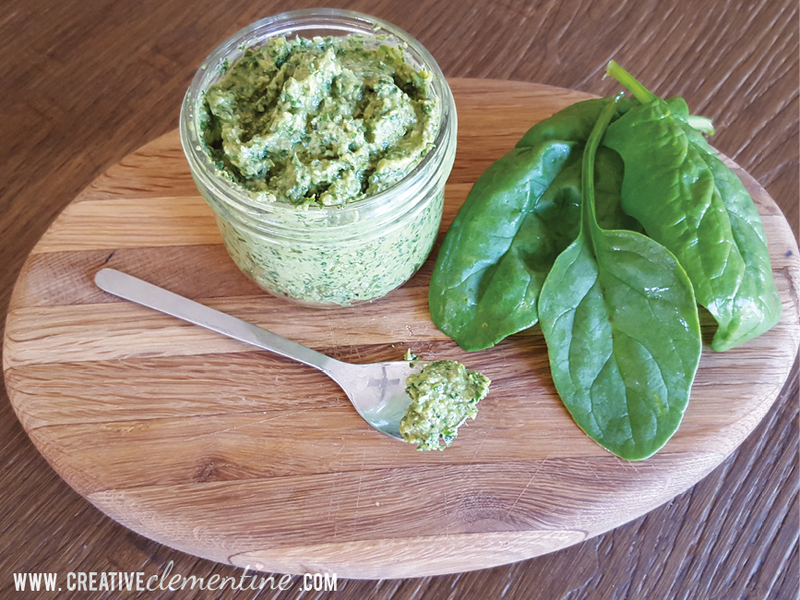 This pesto pairs amazingly well with salty feta and prosciutto, and is an excellent flavour base for a cheesy spinach dip. It also freezes really well, which means you can keep the party going well past garlic scape season! Whoo! Add sunflower seeds, garlic, garlic scapes to a blender or food processor. Blend until seeds are finely chopped. Add the spinach, basil, olive oil and shredded cheese. Mix on high until well combined and smooth. If using lemon juice, add at the end and blend for 10 more seconds. Store in the fridge for up to two weeks, or in the freezer for up to three months. Serve on pasta, meats, veggies, or mixed with mayo on sandwiches. What are your favourite summertime flavours? 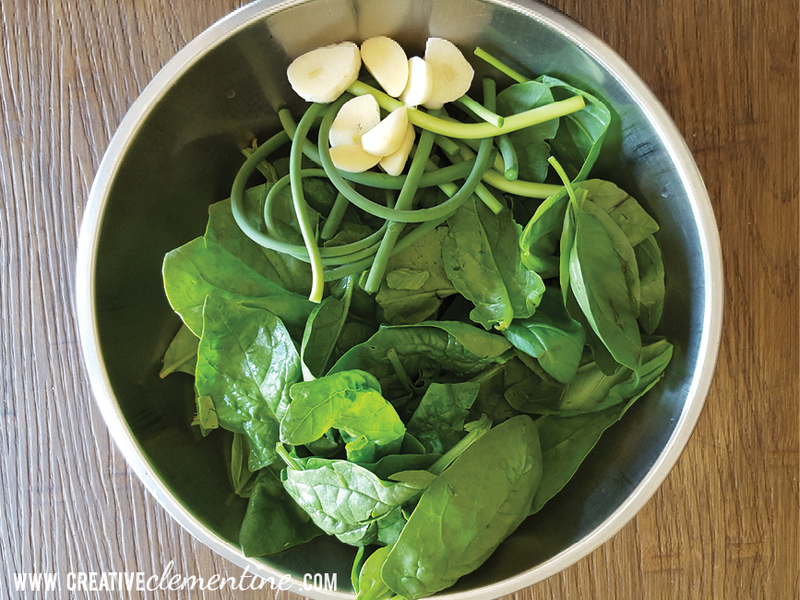 I love garlic scapes - this is definitely a recipe to try!